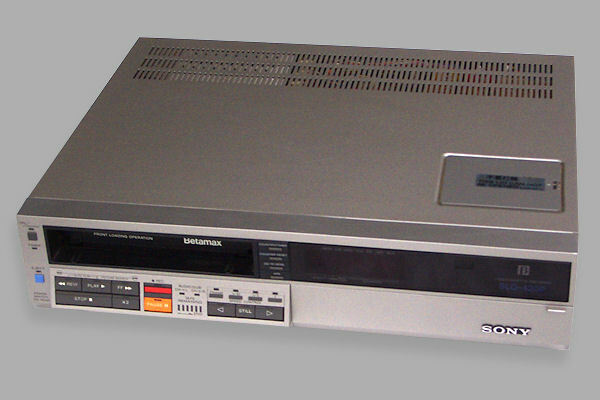 (replaces the tuner board on the SL-C9) The SLO-420P, like its home version the SL-C9, is a very special machine in the range of Sony Betamax machines. This is an "industrial" version and as such has done away with a tuner in favour of adding features for editing. 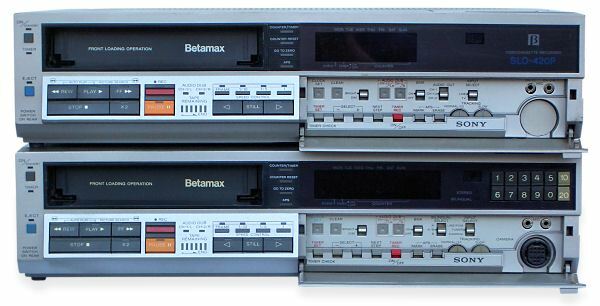 As far as we know, it is the only Betamax unit that can be controlled by a professional controller (such as the RM-580) also used to control the U-matic, Betacam, Hi8/8mm and SVHS/VHS professional units. What makes it so special? Well to put it simply it is because the SLO-420P incorporates many advanced features. Features that even today still put many current video recorders (non Beta included) to shame. From the technical point of view the most amazing achievement of this machine is the tape transport. This uses two separate direct drive dc motors, one for each of the supply and take up reels. The result is that the tape transport is simply beautiful. The ability to change from normal speed playback to trick speeds of one tenth, a fifth, with near frame accurate advance in both forward and reverse which has made it suitable for use as an editing deck. Internally the machine is densely packed with sophisticated electronics. At the centre of the control systems are no less than three micro processors. From the visual point of view the SLO-420P is a stylish front loading machine, Beta Noise Reduction (BNR), audio dubbing facility, perfect picture in pause mode not to mention a real-time counter and APS indexing system. The APS system is a classic example of a feature which was to later find its way on to a rival system. Another nice feature of the SLO-420P is the tape remaining indicator. 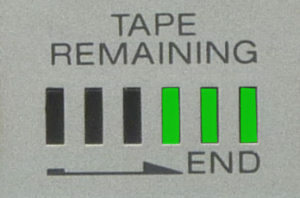 This shows using a six segment LED display, roughly how much tape is left. When the final ten minutes is reached, the remaining LED starts to flash. 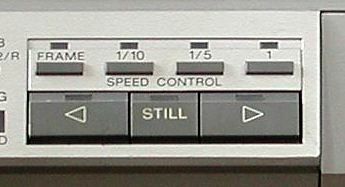 On the SLO420 which has no tuner, the channels selection buttons have been removed and the panel modified to give the machines ID in blue behind the clear plastic. 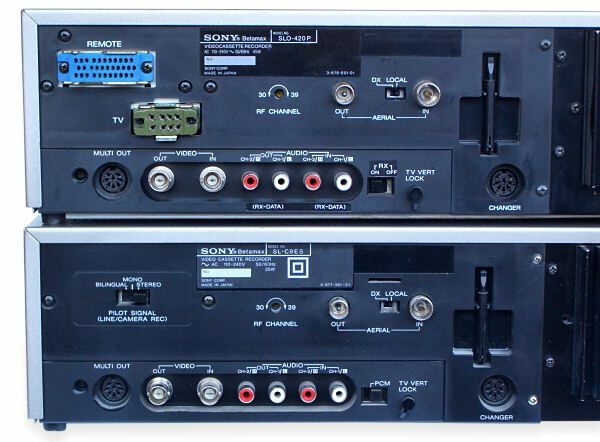 The SLO-420P does not have a camera socket. 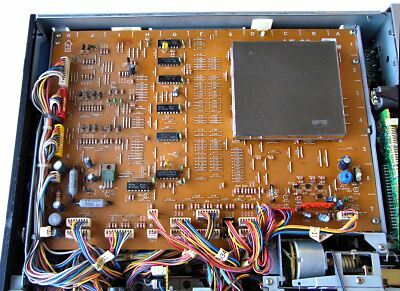 Internally, the tuner board has been replaced with a control board. The front flap has had the internal writing changed to remove the step of selecting the channel. The machines model ID is also not printed on the SLO420s front flap unlike the C9 model. Internally, the SLO420 has black plastic tape loading mechanism gears unlike the C9 which has white gears. 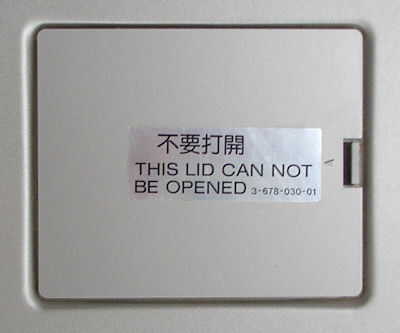 The top panel under which the tuner controls normally sit is glued in place on the SLO420 with the words "THIS LID CAN NOT BE OPENED".